TORRINGTON, Nov. 30 – A team that got to the CIAC Class M playoffs with its defense scored the first five times they touched the ball Tuesday night in the Class M quarterfinals at Torrington High School. Gilbert/Northwestern, whose run into the playoffs was fueled by a dominant victory over Canton and a superb shutout win over Avon two weeks ago, rolled over Plainville, 41-6 to earn its first-ever CIAC tournament win and a berth in the Class M semifinals on Saturday against Hillhouse-New Haven. Gilbert (9-2) was in charge from the start, racing out to a 21-0 lead after one quarter and a 35-0 lead at halftime. The Yellowjackets didn’t allow Plainville a first down until there was about six minutes remaining in the third quarter. The Blue Devils (8-3) had minus 14 yards of offense in the first half. Gilbert quarterback Bob Lippincott threw three TD passes in the first half, two to Sean Fitzgerald of 41 and 66 yards. Lippincott finished the evening completing 4-of-4 passes for 124 yards and 3 TDs. Through three quarters, Gilbert allowed Plainville 10 yards of offense, had five tackles for losses and intercepted a pair of passes. Gilbert scored on its first drive. Lippincott found Fitzgerald down the sideline for a 20-yard completion. But Fitzgerald got away from two Plainville tacklers and raced down the sideline for a 41-yard touchdown pass with just 8:39 gone in the game and a 7-0 Gilbert lead. “They got caught up in the play action fake,” Salius said. Fitzgerald’s extra effort to escape two Blue Devil tacklers fired up the Yellowjackets. “When you see one person make that kind of effort, it pumps up everyone,” Salius said. Plainville went backwards on its first possession. They were hit for losses on two of three plays and on fourth down, the snap sailed high over the head of punter Nick Moshier, who recovered the ball on the Plainville 3 after a 25-yard loss. Gilbert’s Drew McCarthy scored on the next play for a 14-0 lead with 6:00 left in the first half. On Plainville’s next possession, quarterback Antonio Lipizzo lost six yards on a third-and-one play and the Blue Devils had to punt. Two plays later, Lippincott found Fitzgerald in the open for a 66-yard touchdown pass down the right sideline. Connor Gulheen made a nice block to allow Fitzgerald to score and give Gilbert a commanding 21-0 lead with 2:48 left in the first half. Lippincott’s 26-yard run was the key play in Gilbert’s six-play, 63-yard march that made it 28-0 with 9:50 remaining in the second quarter. HISTORICAL TIDBITS that don't mean much: It was the first game between the two teams since 1974 and Gilbert's first win over Plainville since 1953. ... The Yellowjackets lead the series, 7-5. The two teams played seven times from 1934-40. .... Gilbert has never played Hillhouse. 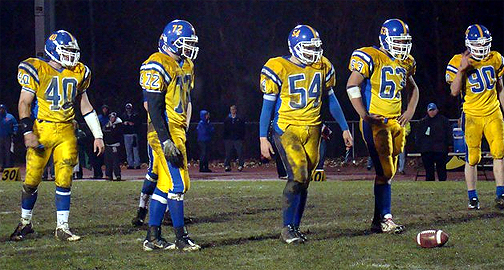 The Yellowjacket defense stood tall in Tuesday night's Class M quarterfinal win over Plainville. From left, Kyle Jones (40), Zach Gain (72), Jim Schmitz (54), Charlie Shea (63) and Sean Fitzgerald (90). WATERBURY, Dec. 4 – For two quarters, the Gilbert/Northwestern Regional football team stood toe to toe with New Haven’s Hillhouse High. Even after the Academics raced out to a two-touchdown lead after one quarter, the Yellowjackets were able to use their defense to take a two-point lead. But Hillhouse was too quick and too hard hitting. Five Gilbert players left the game with injuries and some key defensive plays by the Academics enabled No. 8 Hillhouse to earn a spot in the Class M championship game with a 42-14 victory over No. 4 Gilbert at Municipal Stadium Saturday. After Hillhouse (9-3) took a 12-0 lead by scoring on its first two drives of the first quarter, the Yellowjackets responded with a pair of touchdown drives to take a 14-12 lead. Gilbert actually moved the ball well on its first drive, getting as far as the Hillhouse four-yard line before the Academics stiffened forcing a 26-yard field goal attempt that was short. Trailing 12-0, Gilbert quarterback Bobby Lippincott raced 26 yards around the end fo the Hillhouse 42-yard line. Two plays later, Drew McCarthy broke through the line for a 30-yard touchdown run. John Ambrozaitis’ kick was good to cut the lead to 12-7. On Hillhouse’s next possession, the Academics got as far at the Gilbert 21 but were set back by a holding penalty. On fourth and seven from the Gilbert 39, McCarthy made a great open field tackle to help the Yellowjackets take over on downs. Gilbert wasn’t able to take advantage and on fourth down, Lippincott nailed a 57-yard punt that was downed on the Hillhouse 4-yard line. On the first play, Gilbert’s Kyle Jones forced a fumble that Lippincott recovered. Two plays later, Lippincott scored from three yards away for a 14-12 lead with 4:55 left in the second quarter. Molway, who led Gilbert with 110 yards on 14 carries, had a 49-yard run to the Hillhouse seven on that initial drive. But after a three-yard gain to the four, Lippincott was hit for a five-yard loss and a third down pass was incomplete. Gilbert nearly led at halftime. Hillhouse took over on its own nine-yard line with 1:42 left in the second quarter. But sophomore quarterback Je’Vaughn Moore calmly led Hillhouse downfield. The Academics ran for 47 yards on five straight running plays before Moore completed a 22-yard pass to Steven DeJournett and a 10-yard pass to Andre Anderson to the Gilbert 13 with 15 seconds remaining. After an incompletion, Moore found William Glover in the end zone for a 13-yard touchdown pass. A two-point conversion run from Taurese Washington made it 20-14 with 7.4 seconds remaining. Injuries were beginning to take their toll on the Yellowjackets. On the first play of the game, John Lippincott, Gilbert’s starting outside linebacker was injured with a concussion. In the second quarter, John Marshall, a starter on both sides of the ball was injured trying to recover a kickoff. On its opening drive of the third quarter, Hillhouse tried gain a first down on fourth-and-one near midfield. Gilbert held and took over. But after a 18-yard run by Molway, he was stripped of the ball by Glover. The ball spun on its nose and nearly rolled out of bounds. But it didn’t and Glover scrambled on all fours to recover the ball. Three plays later, Hillhouse’s Harold Cooper ran 25 yards to the Gilbert 42-yard line. Then Moore hit Glover for a 42-yard touchdown pass down the sideline for a 28-14 lead. Gilbert wasn’t dead, yet. McCarthy had a 39-yard kickoff return to the Gilbert 45. With some nice running from Lippincott (32 yards on 3 carries), the Yellowjackets marched to the Hillhouse seven.. Molway gained three yards to the four and Kyle Jones gained two to Academics two. On third down and goal, Lippincott got to the one. But on fourth down, Jones was stopped and the Academics took over with 2:40 left in the third quarter. A play earlier, Gilbert center Jim Schmitz was injured and was out for the game. Hillhouse added a pair of touchdowns from Taurese Washington in the fourth quarter. Jones and Molway were injured in the final quarter and left the game. Moore completed 7-of-13 passes for 158 yards and two touchdowns. Cooper, only a freshman, ran for 130 yards on 13 carries. Washington finished with 97 yards on 13 carries for Hillhouse. STRATFORD, Dec. 4 -- Jevon Elmore ran for 151 yards and two touchdowns and New London advanced to its 11th state championship game with a 30-12 win over Brookfield in the Class M semifinals at Bunnell High School. Elmore's 72-yard run with 9:38 remaining allowed the Whalers (10-2) to turn a 17-12 lead into 23-12. Elmore scored on a 73-yard run earlier in the game. Kyle McKinnon ran for 153 yards for the Whalers. New London quarterback Josh Clements completed 10 of 19 passes for 111 yards and also kicked a 25-yard field goal on the last play of the first half to give New London a 17-12 lead. Boeing Brown finished 20-of-37 for 291 yards, a touchdown and three interceptions for Brookfield (9-3). Brown hit Brian Kelly from 59 yards out to give the Bobcats their only lead, 6-0, with 9:09 left in the first period. Leaon Gordon led Brookfield with 83 yards rushing. MIDDLETOWN, Dec. 4 -- Montrell Dobbs ran 36 times for 363 yards and four touchdowns -- four in the second half -- and No. 3 Ansonia ran away from second-seeded Montville, 46-15, in a CIAC Class S semifinal at Middletown High Schoo. Dobbs ran for a 51-yard score with 3:53 remaining in the second quarter to cap a 99-yard drive. He had touchdown runs of 23, 29, 1 and 1 in the second half. Montville's Tyler Girard-Floyd injured his right ankle on the first play from srimmage -- a 1-yard run -- and didn't have another carry. He played sporadically at defensive end and took some snaps from quarterback in Montville's Wildcat package, throwing an interception on his only attempt. Skyler McNair ran 16 times for 132 yards and a touchdown for Montville (10-2), but lost two fumbles inside the 5-yard line. Freshman Arkeel Newsome caught a 47-yard touchdown on a screen pass from Elliot Chudwick for Ansonia's first score and finished with 60 yards rushing on 12 carries. Newsome also had a pair of interceptions on defense. Montville quarterback Troy Nunes was 9-for-18 passing for 164 yards and a 22-yard touchdown to Robert Johnson, who caught four passes for 85 yards. Brandon Johnson caught three passes for 46 yards. WATERBURY, Dec. 4 – St. Joseph-Trumbull returned to the Class S championship with a 44-7 rout of top-ranked Valley Regional/Old Lyme at Municipal Stadium. The Cadets exploded for 30 points in the third quarter to break open a seven-point contest. Senior QB Joe DellaVecchia completed 9-of-15 passes for 194 yards and 2 TDs for St. Joseph (9-3). Senior teammate Tyler Matakevich (12-87) ran for 2 TDs. St. Joseph scored 16 points in 34 seconds in the third quarter to take a 30-7 lead. Following Matakevich's 25-yard touchdown run, Valley Regional took a safety. Then DellaVecchia connected with Pat Mulligan on the first of two long touchdown passes, hooking up for 55 yards. Valley Regional/OL (11-1) scored their only touchdown on the game's opening drive. Mitchell King hauled in a 19-yard touchdown pass from quarterback Jimmy Fairfield-Sonn. They reached the St. Joseph 4-yard line on their next possession but turned the ball over on downs. SHELTON, Dec. 4 - Quarterback Casey Cochran completed 18 of 22 passes for 365 yards and a touchdown and ran for another TD for No. 1 seed Masuk dominated FCIAC champion Darien, 41-0 at Funn Stadium. Cochran, the Gatorade State Player of the Year as a junior, completed all 18 of his passes through three quarters. His one touchdown throw was 47 yards on a screen pass to Tom Milone with 24.7 seconds left before halftime to make it 28-0. His 1-yard TD run was the game's final touchdown to give Masuk (12-0) the 41-0 lead with 1:59 left in the third quarter. 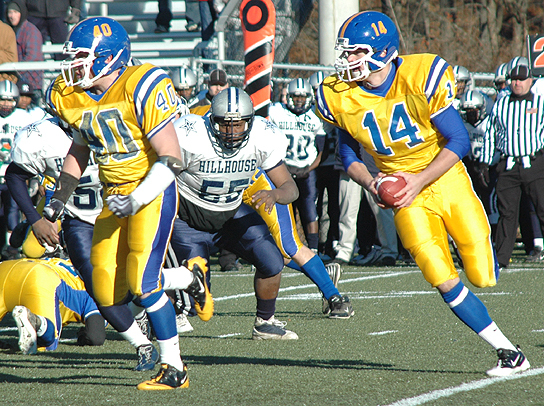 Colin Markus was the leading ground gainer for the undefeated Panthers, rushing for 96 yards and the game's first two touchdowns on 17 carries. Graham Maybell led the Blue Wave (11-2) with 108 yards on 14 carries. Darien quarterback Chris Allam completed 9 of 26 passes for 123 yards and two interceptions. The first interception was returned by Joe Diaz for a 55-yard touchdown to make it 21-0 with 5:42 left in the seocnd quarter. The Blue Wave had an opportunity to tie the game at 7 late in the first quarter. Their eight-play drive moved down to Masuk's 1, but Brian Wiegand fumbled into the end zone, recovered by Masuk's Shawn Flynn with 19.2 seconds left in the period. Markus then went down and scored his second touchdown to give Masuk a two-touchdown lead. RUSHING: Masuk: Colin Markus 17-96, Tom Milone 3-44; Darien: Graham Maybell 22-98; Chris Allam 5-23. WEST HAVEN, Dec. 4 -- New Canaan (11-1) gets an opportunity to win its fifth straight state title after beating Hand in the Class L semifinals, 39-21 at Ken Strong Stadium. Kevin Macari had eight catches for 110 yards and three touchdowns and returned a fumble 35 yards for another score for the No. 3 Rams. New Canaan scored 22 points in the third quarter to take a 39-14 lead. Matthew Milano was 18 of 29 for 188 yards with three touchdowns for New Canaan (11-1). Macari added another fumble recovery on a kickoff, Cameron Armstrong had two interceptions and Ryan Shullman had one-and-a-half sacks, including one for a safety. Zach Miller was 17 of 29 for 210 yards with two interceptions and a touchdown for the Tigers (10-2). He also ran for 53 yards and a touchdown on 17 carries. RUSHING - New Canaan, Joseph Costigan 18-90, Matthew Milano 5-24, Conor Goodwin 5-20, Kevin McDonough 4-18; Hand, Zach Miller 18-53, Michael Leone 9-14, Kevin Frey 5-23, Nicolas Vitale 4-12, Dillon Wilson 1-3. PASSING - New Canaan, Matthew Milano 18-29-188; Hand, Zach Miller 17-29-2-210. RECEIVING - New Canaan, Kevin Micari 8-110, Patrick Newton 4-39, Connor Kilbane 2-17, John Brainard 1-7, Cameron Armstrong 1-6, Conor Goodwin 1-5, Willie Gould 1-4; Hand, Nicolas Vitale 6-91, Alec Pacelli 5-61, Chad Crisco 5-59, Leif Colberg 1-(-1). NEW HAVEN – Top-ranked Xavier used a smothering defense to beat Glastonbury, 24-13 and earn a spot in the Class LL championship game at Jess Dow Field in front of 3,941 fans. The Falcons sacked Tomahawk QB Cory Santor seven times and limited Glastonbury to 282 yards of offense. Xavier’s Mike Mastroiani rushed 29 times for 114 yards for the Falcons (12-0). Glastonbury's Malcolm Crosson returned the opening kickoff 85 yards for a touchdown, but the Falcons went on to score 18 unanswered points. Xavier's Graham Stewart returned a fumble 17 yards for a touchdown to give Xavier a 18-7 lead with five seconds left in the first half. Santor completed 11-of-19 passes for 89 yards for Glastonbury (10-2). G: Crosson 85 kickoff return (Solecki kick), 11:47. RUSHING-Glastonbury, Crossom 7-42. Xavier, Mastroiani 29-114. PASSING-Glastonbury, Santor 11-19-0-89. Xavier, Boyle 5-12-1-66. RECEIVING-Glastonbury, Crossom 4-26. Xavier, Murphy 3-30. WEST HAVEN, Dec. 4 – Ian Milne scored 2 TDs and ran for 104 yards on 20 carries to lead Trumbull (11-2) to a 21-6 win over previously undefeated NFA in the Class LL semifinals at Ken Strong Stadium. Milne also had a fumble recovery and interception for No. 3 Trumbull (11-2). Don Cherryadded a six-yard TD for the winners. For No. 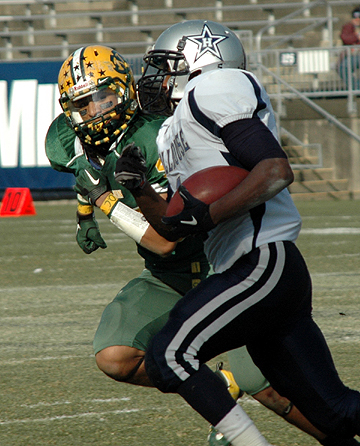 2 NFA (11-1), the Wildcats fumbled the ball on the Eagles’ goal line on back-to-back possessions in the third quarter. NFA scored on a 19-yard TD pass from Eric Washburn to Jaron Russell. RUSHING, Trumbull, Ian Milne 20-104, Matt Lena 12-55, Don Cherry 12-54, Phil Terio 2-24, Nick Lombardi 1-9. NFA, Anthony Facchini 21-66, Erik Washburn 3-39, Isaiah Smith 2-8, Joey Paparelli 2-8, Colin Smith 1-5, Marcus Outlow 1-1. PASSING, Trumbull, Ian Milne 6-10-1-83; NFA, Erik Washburn, 6-11-3-96. RECEIVING, Trumbull, Phil Terio, 4-53, Thomas Pauciello 2-24; NFA, Jaron Russell 2-33, Colin Smith 2-21, Joey Paparelli 1-27, John Caruso 1-15. 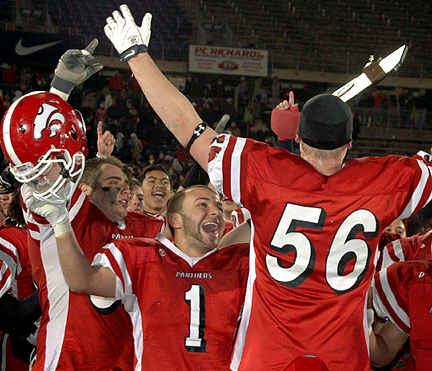 Masuk's Peter Perimenis (1) celebrates with teammates after the Panthers won the Class L championship with a 50-20 win over New Canaan. Right, Hillhouse's Harold Cooper (1) tries to get away from New London defender Jason Piontkowski (4) in Hillhouse's 7-0 victory in the Class M championship game.